I’m not going to lie to you: These ribs take 2 days to make. Now don’t roll your eyes, and remove that finger from the keyboard poised to click away. Just hear me out. I promise that if you make these ribs, you will be one very happy cook. Your family will be eternally grateful. Your guests will be impressed. And you will be rewarded with a deeply flavorful, warmly spiced, tender and rich meal. The only people who might not be pleased will be your neighbors, because they will have to live through a day of incredible aromas wafting from your kitchen window, making their stomachs rumble, while knowing full well they are not coming to dinner. Now if none of this is enticing enough, here is some good news: While it takes 2 days to make these ribs, most of the time your are doing nothing. Well, hopefully you’re doing something, but nothing related to this recipe. During this time, the ribs will take care of themselves, braising in the oven or sitting in the refrigerator. You will be actively involved in the beginning, when you brown the meat (a very important step, I might add, which will make you feel useful), then when you reduce the sauce (which technically your stove will do for you), and then prettifying the stew for serving. Your biggest hardest most tortuous task will be…waiting. But consider that a gift in this era of clicks and instant gratification – the celebration of process and patience yielding intoxicating results. All of the time invested is for good reason: to tenderize the beef to a supple version of itself, and to infuse the meat and stew with knock-your-socks off flavor. So go ahead and give it a try. Start on a Friday and eat it over the weekend. And feel free to double the amount so you can freeze extras for another day or have a party. It might be a good time to invite the neighbors over. Day 1: Combine the dry rub spices in a small bowl. Arrange the ribs on a rimmed baking tray. Rub the spices all over the ribs. Let stand at room temperature for 1 hour or cover and refrigerate for up to 24 hours. Remove from refrigerator 30 minutes before browning. Preheat the oven to 300°F. Heat 2 tablespoons oil in a large ovenproof pot with lid or a large Dutch oven over medium-high heat. Brown the ribs in batches on all sides without overcrowding the pan, about 8 minutes. (This step is very important, so take the time to do it well). Transfer to a plate or bowl and repeat with remaining ribs. Drain off all of the fat from the pot. Add 1 tablespoon oil, the chopped onion, chopped carrot, and garlic. Cook over medium heat, stirring up any brown bits in the pan, until the vegetables begin to soften, about 3 minutes. Add the cumin, paprika, and coriander and cook, stirring, until fragrant, about 30 seconds. Add the wine, tomato paste, chipotles, and bay leaf. Return the ribs and any collected juices to the pot. Add the beef stock. If the ribs are not completely covered with the liquid, add more stock as necessary. Bring to a boil, then turn off the heat. Cover the pot and transfer to the oven. Bake until the ribs are very tender, about 3 hours, stirring once an hour. With tongs or a slotted spoon, carefully transfer the ribs to a cutting board to cool. When cool enough to handle, remove any remaining bones (most will have fallen off) and cut away any of the tough gristle. Return the pot to the stovetop and bring the sauce to a boil over medium-high heat. Cook, uncovered, until liquid is reduced by about half and thickened to a sauce consistency, 10 t0 15 minutes. Strain the sauce into a bowl, pushing down on the solids to extract flavor, then discard the solids. Return the beef to the sauce, submerging completely. Cover and refrigerate overnight. Day 2: One hour before serving, remove the ribs from refrigerator and turn on the oven broiler. Scrape away any congealed fat collected on the surface of the stew. Gently rewarm on the stovetop over medium-low heat to liquefy the sauce. Carefully remove the meat from the stew and arrange in a baking dish. Broil the meat until dark brown, turning once, about 2 minutes per side. Heat 1 tablespoon olive oil in a skillet over medium heat. Add the onions, the sliced carrots, and a pinch of salt. Saute until crisp tender, about 2 minutes. Bring the sauce to a low simmer. Add the brown sugar and balsamic vinegar and taste for seasoning, adding more salt if necessary. Add the onions and carrots. 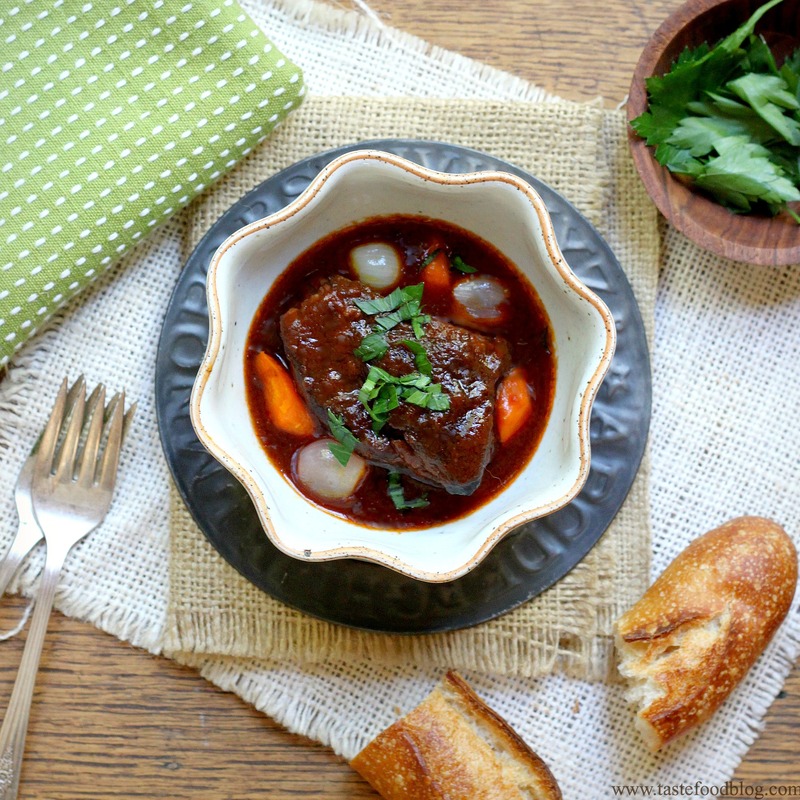 To serve, divide short ribs between serving dishes or shallow bowls. Ladle the sauce over and around the meat. Serve immediately, garnished with fresh parsley. Note: To freeze the ribs, prepare all of the Day 1 steps. On Day 2, scrape off the congealed fat, and then freeze. To continue, defrost the stew in the refrigerator overnight. One hour before serving, proceed with broiling the meat and the remaining steps. Perfect recipe, if you ask me! And so convenient to make for a dinner party, as all the work can be done the day before… love this! I love short ribs…can’t wait to try your recipe. Very well worth the time – I always take 2 days to do short ribs. A comforting cold weather dish! Yummy. These sound incredible, I don’t care if it does take 2 days some things are worth the wait. Great recipe. Oh my goodness! My husband would adore this short rib recipe. Lush with flavor and delightfully satisfying, a great dinner! At what step in the process would it best to freeze since I want to make ahead of time? To freeze the ribs, prepare all of the Day 1 steps. On Day 2, scrape off the congealed fat, and then freeze. To continue, defrost the stew in the refrigerator overnight. One hour before serving proceed with broiling the meat and the remaining steps. Can’t wait to try this this weekend, looks amazing as your recipes usually are! This looks incredible. We are on a huge braising kick. Then again, every fall and winter, braising is king of the kitchen. The addition of the smoky heat from chipotles is a nice touch of extra heat during our chilly foggy winters. When browning the meat will the dry-rub spices burn? It may scorch in places, but don’t be alarmed – turn the heat a tad lower or move the meat around. When you drain off the fat, take a kitchen towel (in tongs) and wipe out the pot before proceeding. The flavor will not be impacted. Kitchen towel = paper towel. It’s short rib season again….yippee!